We are a National Supplier, of Mold Removal & Prevention, HVAC, Interior and Exterior Cleaning Products. We are a National Distributor of Mold Removal & Prevention, HVAC, Interior and Exterior Cleaning Products. Proudly supplying the Mold Remediation, Restoration, HVAC and Cleaning Industries. With crossover into Construction markets. All of Our Products are Green ! EPA Approved Ingredients and Biodegradable. Mold Zap, Mold B Gone, Mold Shield. Clean Air & Coil Cleaner. For Woods, Decks, Concrete, Siding & Roofing. Wood Renu, Deck Wash, Deck Strip, Deck Brite. Total Clean, Stain Out, Stain Magic. 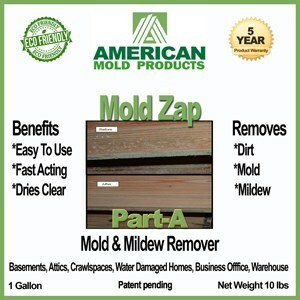 One of Our Top 3 Products is Mold Zap. M-F 8:30AM to 5:30PM EST. We do check messages after hours, for our customers across the country. CitriFresh USA supplies products to customers, throughout the Continental US.